Choosing an airline for a domestic flight in another country, on another continent can feel daunting: There are the international carriers you are familiar with, but they are more expensive. Then there are the low-cost airlines, but you don’t know how safe or reliable they are. Choosing the right airline to fly domestically, or within Southern Africa, depends entirely on your needs, fears, wants and budget. There are 7 passenger airlines to choose from that fly domestically within South Africa. The bigger airlines fly between all the major cities, and the smaller airlines connect passengers to the smaller cities and towns. Passengers need to check in an hour before departure for all domestic flights. All 7 major carriers offer online booking, with credit card or EFT (electronic funds transfer) options. South African Airways is South Africa’s largest airline and the national flag carrier. It has a fleet of 54 aircraft and is the only airline in Africa to have been given the very prestigious 4 Star airline ranking from Skytrax, which runs an airline and airport review and ranking site. South African Airways offers economy, business, and first class. First class is not always available on domestic flights due to the short flight times. South African Airways flies to 38 destinations worldwide from its major hub at O.R Thambo International Airport in Johannesburg. South African Airways is the choice airline for a passenger traveling domestically for several reasons: The airline will assist you if you have missed your domestic flight connection as a direct result of your international flight being delayed- they can only do this if you have bought your international and domestic flight on one ticket. It then becomes the airline’s responsibility to get you on the next available flight. If however, your domestic flight is on another airline (different to your international South Africa Airways carrier), you forfeit their assistance if you miss your domestic flight. South African Airways has a large fleet: They can assist more readily if you require an emergency flight, and they can take you to and from many different locations within South Africa, Africa, and the world. In 2012 South African Airways won “Airline of the Year” award, as well as “Best Airline to Africa” and “Best Business Class White Wine”, at Global Traveler magazine’s annual awards gala in Los Angles. South African Airways is also covered by the United States rule for non-discrimination on the basis of disability. A disabled passenger can notify the airline beforehand of their disability, so that that they can make the necessary arrangements to assist you and to make your journey enjoyable. South African Airways should be your first choice when flying domestically in South Africa. It is a world-class airline with a large fleet and the capacity to assist you with emergency flights and other problems that may arise. South African Airways is only a fraction more expensive than the low-cost carriers, but it is good value for your money, reliable and has a good safety record. South African Airways has domestic routes that fly between Johannesburg, Cape Town, Durban, East London, Port Elizabeth George, Bloemfontein, Pietermaritzburg, Mthatha, Kimberley, Polokwane, Richards Bay, Upington, Nelspruit/Kruger, Hoedspruit, Phalaborwa, Mmabatho, Manzini, and Maseru. South African Airways also flies to countries like Namibia, Botswana, Zimbabwe, Mozambique, Zambia, Kenya, Malawi, Tanzania, and Mauritius, making it safe, easy and convenient to connect to from Johannesburg. Business Class: 1 piece at a maximum of 32 kg (70 lb) and maximum dimensions of 158cm (62inches). Economy Class: 1 piece at a maximum of 23 kg (50 lb) and maximum dimension of 158cm (62inches). Kulula had their inaugural flight in 2001 and is South Africa’s first low-cost airline. In 2007 they already won the “Skytrax” award for the best low-cost airline in Africa. Kulula is owned by the experienced aviation company Comair Limited, and has extended the routes they fly by offering British Airways (also operated by Comair Limited) destinations: These include Windhoek, Livingston, Victoria Falls, Harare, and Mauritius. Kulula is a good and reliable airline. It remains a good choice if you want to fly with a low-cost carrier. Passengers should be aware that although Kulula is a low- cost airline, that the price difference between them and British Airways is not always huge, so make sure you compare the Kulula prices with other airlines first. British Airways is the flag carrier airline for the United Kingdom. British Airways had its official start in the 1930s when it was created as a result of several smaller airlines merging. Since their start, British Airways has expanded to traveling to more than 400 destinations worldwide. Choosing British Airways as your domestic carrier is a good idea if you are using them for your international flight. It is always beneficial to book your international and domestic flights on the same ticket, in case you miss your flight due to a delayed connecting flight. British Airways is a reliable airline, with a good safety record. They offer business and economy class on their domestic routes (unlike low-cost airlines). It is a fantastic second choice option to South Africa Airways. British Airways offers return flights to and from Cape Town, Johannesburg, Durban, Port Elizabeth, The Kruger National Park, and Nelspruit. British Airways also offers the same assistance as South African Airways to passengers who have missed their domestic British Airways flight due to a delay on their international one (if it has been bought as one ticket). Mango is a low-cost airline operated by South African Airways. Mango only offers economy class seating, and passengers need to buy their own meals, or snacks (in cash) onboard their flights. Although they are owned by South African Airways, SAA takes no responsibility for domestic flights missed on Mango due to an international SAA flight delay (and vice versa). Passengers should keep in mind that you cannot pay for someone else on the Mango website using your own credit card if you are not also flying: The credit card holder needs to be present at check-in. Mango is not a terrible airline but makes a habit of being delayed. Not the ideal airline if you are traveling with small children, the elderly or if you have to connect to an international flight. Routes: Mango offers flights between Cape Town, Johannesburg, Durban, George, Port Elizabeth, and Bloemfontein. Economy: 1 piece at 20kg (44 lb). Airlink is a privately owned airline and has become South Africa’s first feeder network that links smaller towns, regions, and hubs, by putting in place code-sharing and schedule coordination agreements with South African Airways and South African Express. It is a predominantly short- distance carrier that uses Johannesburg as its hub. The aircraft are small and not as spacious as the bigger, long-haul aircraft. It does, however, remain one of the safest and most comfortable ways to reach the smaller cities or towns in South Africa. Airlink serves several destinations within South African borders, namely Cape Town, Durban, Johannesburg, Bloemfontein, Port Elizabeth, East London, George, Kimberly, Nelspruit, Pietermaritzburg, Upington, Umtata, Polokwane, and Phalaborwa. Airlink also offers flights to and from Botswana, Lesotho, Madagascar, Mozambique, Swaziland, Zambia, and Zimbabwe. South African Express operates independently from South African Airways but has incorporated its flights within the strategic alliance with Airlink and South African Airways. 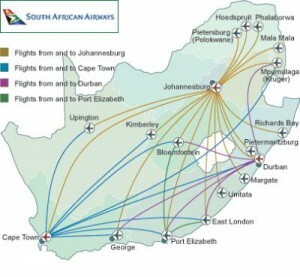 The airline also utilities the South African Airways reservations, check-in facilities, and designation code. The airline is a domestic and regional carrier only, and we recommend using them only if you can not get a South African Airways or Airlink flight. It flies to and from Cape Town, Johannesburg, Durban, Bloemfontein, East London, George, Hoedspruit, Kimberly, Nelspruit, Port Elizabeth, and Richards Bay. Its international flights include Botswana, Mozambique, Namibia, Zambia, Zimbabwe and to the Democratic Republic of Congo. Federal Air, also affectionately known as“Fedair” is an innovative air shuttle service in Southern Africa. Federal Air is also the choice airline to fly into bush lodges. They will fly passengers to lodges that have small and private landing strips: Places other airlines will not fly to. Federal Air is experienced in flying and landing in the bush and has an exceptional safety record. By flying with them, tourists eliminate long and often costly road transfers. Passengers should be aware that Federal Air will sometimes fly 1 or 2 passengers into a lodge in a 4-seater plane. It is a wonderful start to the safari experience for those who are not afraid of flying: The pilot can fly low to allow you to watch some game, but it can be a bit intimidating for those scared of flying. One great feature about Federal Air is that routing and departure times vary from day to day, depending on the actual lodge and guest requirements. Time of departure can change without notice, creating flexibility for guests to catch their flight, even if they have a delayed international flight or transfer. It flies to and from Johannesburg, Hoedspruit, Nelspruit, Phinda private game reserve and Pietermaritzburg. They also have an international connection to Vilanculos in Mozambique. 1 piece at 20 kg (44 lbs) per person in a soft bag. Below is a list of internet resources for those who want to find out more about the domestic carriers in South Africa. To find out more about South Africa Airways please visit http://www.flysaa.com/za/en/home.action?request_locale=en_ZA for updated fares and news. Visit http://www.kulula.com/ to find out more about fares on the low-cost carrier Kulula. Please visit http://www.flyairlink.com/ if you are flying to a smaller town or city and looking for flight options. Alternatively, go to http://www.flyexpress.aero/ for more options. If you are going on safari then go to http://www.fedair.com/shuttle-services#.Uh73Cxuno2U to find out about the flight into game reserves and lodges.